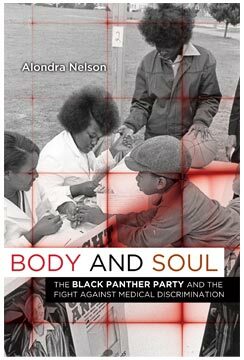 In her book, Nelson writes that “the Party’s focus on health care was both practical and ideological.” On a practical level, the BPP provided free community health care services, including preventative education. Simultaneously, the BPP railed against the medical-industrial complex, declaring that health care was “a right and not a privilege.” Ronald “Doc” Satchel, the minister of health for the Chicago BPP, wrote in the BPP newspaper that “the medical profession within this capitalist society…is composed generally of people working for their own benefit and advancement rather than the humane aspects of medical care.” A newsletter published by the Southern California chapter argued that “poor people in general and black people in particular are not given the best care available. Our people are treated like animals, experimented on and made to wait long hours in waiting rooms." While citing Martin Luther King’s 1966 declaration that “of all forms of inequality, injustice in healthcare is the most shocking and inhumane,” one chapter provides an important historical context for the BPP’s health activism by detailing what Nelson calls “the long medical civil rights movement,” that began long before the BPP. “Mobilized in response to the distinctly hazardous risks posed by segregated medical facilities, professions, societies, and schools; deficient or nonexistent healthcare services; medical maltreatment; and scientific racism, activism challenges to medical discrimination have been an important focal point for African American protest efforts and organizations. The Panthers were heirs to health activism that directly reflected tactics drawn from this tradition,” writes Nelson. Nelson says the central focus of her scholarly work is on “the intersections of science, technology, medicine and inequality.” She has co-edited Technicolor: Race, Technology, and Everyday Life (2001) and Genetics and the Unsettled Past: The Collision of DNA, Race, and History (scheduled to be released in March, 2012). To learn more, please visit www.alondranelson.com. Angola 3 News: In our recent interview with Billy X Jennings from It’s About Time BPP, one theme explored was how, with rare exception, the mainstream media has misrepresented the BPP. However, it seems that the even the radical and anti-capitalist media has generally underreported the health activism that is the focus if your book. How did the BPP’s health activism relate to their better-known stances against white supremacy, capitalism, and police violence? Alondra Nelson: Yes, it’s true. The Black Panthers’ health activism has been under-reported across the ideological spectrum. Their critics obviously did not want to cast them in a positive light. And, as your question suggests, even the Party’s supporters said little about this important aspect of the BPP’s work. I think its plausible to say that many on the Right and some of us on the Left--in very different ways and for completely opposite reasons--were captivated by a vision of the Party that did not include its health politics. Depictions of African Americans working in their neighborhoods, wearing white medical coats, was unspectacular compared to images of Black radicals wearing leather jackets and carrying guns. It is ironic that our collective memory of the Panthers remains so incomplete because their health activism—from their political writing about medical issues in The Black Panther newspaper, to their practice of DIY healthcare—exemplified the anti-racist, anti-capitalist stance for which they are known. In fact, the reality of health inequality brought the BPP’s political perspective into sharper relief because it offered stark and specific examples of how economic and racial oppression literally damaged bodies, families and communities. As you know, the BPP was originally the Black Panther Party for Self-Defense, a name that reflected that protecting communities from police brutality was a primary motivation for the group’s founding. The BPP exposed the misuse of power whether it was at the hands of police officers or physicians. So, it’s also useful to think of the Panthers as being engaged in medical self-defense. In Los Angeles, Party members Ericka Huggins and Elaine Brown, nursing professor Marie Branch, Dr. Terry Kupers, and others established that chapter’s People’s Free Medical Clinic. But, like all of the BPP’s health activism, this work extended beyond the clinic, including in this case, confronting police brutality. (Branch shared meeting notes with me from the 1970s from her personal archive where the formation of BPP health programs and prisoners’ protection from medical discrimination were seamlessly discussed). The LA Panthers advocated for and provided health care for incarcerated persons; some of these men and women needed medical attention because they had been abused while in police custody. A3N: How does the story of the BPP’s health activism, as presented in your book, contribute to and challenge the traditional presentations of the BPP by both the mainstream and alternative media? AN: Body and Soul offers an account of the BPP that moves away from the narrow confines of the so-called “culture wars,” in which the Party can only ever be a positive force or a negative element. Paying attention to the Party’s health activism calls into question the inaccurate stereotype of the activists as aimless thugs. We also gain a different perspective on things we thought we already knew about the BPP, like the fact that the Panthers were avid followers of Fanon, Che and Mao, whose writings were required reading for all members. Through the prism of health, one can see very clearly the influence of Fanon’s dissection of colonial medicine in Algeria on the Panthers’ understanding of medical discrimination in the U.S. We can take seriously the fact that Fanon and Che were physicians as well as political thinkers. We can appreciate that Mao, who established the “barefoot doctors” lay health worker program, made available to the Party not only broad revolutionary principles, but also specific ideas about health care as political practice. A3N: What do you think were the most successful tactics employed by the BPP as part of its health activism? Strategically speaking, what lessons from the BPP’s health activism do you think are most applicable for today’s activists to learn from? AN: In addition to setting up their own clinics, they used legal approaches not dissimilar from the NAACP to voice their opposition to problematic biomedical research. The Party leadership realized early on that “policing the police” would not be the only method they used in their effort to topple racism and capitalism. The Panthers were pretty flexible tacticians. One of the lessons that the BPP offers today’s activists is that they should be more loyal to the desired outcome than to the tactic. The sit-in came to be associated with the southern civil rights movement just as the mic check is now emblematic of the Occupy movement. But these groups also used other tactics: marching, occupying, sermons, etc. Social movements are dynamic phenomena; circumstances are constantly changing. So too should tactics. One of the BPP’s more fascinating tactics was what I call, after sociologist Lily Hoffman, the “politics of knowledge.” Working in this vein, the Panthers engaged and reinterpreted scientific ideas about race and disease. They reinterpreted scientific theories about the causes of sickle cell anemia, for example, by placing the prevalence of the disease in the context of the history of the transatlantic slave trade, the medical-industrial complex and contemporary racism. The Panthers use of this tactic—the politics of knowledge—should remind today’s activists that “framing” matters. It is important to be able to translate political arguments—health-related ones and other ones—into language, into stories really, that resonate with the broader public. The Party could be expert at this. The Nixon administration and mainstream philanthropies would ultimately coopt the issue of sickle cell anemia. But the BPP played a key role in raising awareness about the disease and in situating it in a powerful political language that could mobilize communities. While writing that the defeat of the Center was a “notable triumph,” you note further that it “was somewhat of a Pyrrhic victory for Newton and his allies, as blocking resources to the center as an entity would not prevent individual researchers from pursuing other sources of support for their investigations.” With this in mind, how has biologization of violence research progressed since the 1970s? How much influence has it had on public policy? AN: Attempts to attribute the causes of violence to biology (and closely related to this, criminality) are a very old story. In the late 19th century, the influential Italian criminologist Lombroso, claimed that new methods (e.g., phrenology) and theories (e.g., social Darwinism) showed that the tendency toward criminal behavior was inherited. More than one hundred years later, similar ideas persist. In the 1990s, during the first Bush presidency, Louis Sullivan, the Secretary of Health and Human Services set-up a “violence initiative” to explore the biological models of social unrest in urban settings. Your readers may recall that around the same time another Bush official, referencing studies on violence among non-human primates, said that disproportionately black and brown “inner cities” were like “jungles.” (The initiative and controversial commentary around it would recall to the heated debate the Panthers were engaged in over plans to form a “violence center” at UCLA in the 1970s that may have had an especially harmful impact on black and Latino youth and men). Recently behavioral researchers have aimed to link the presence of what has been called the “warrior gene” to violent, criminal behavior. At a time when we are learning even more about the complexities of genetic inheritance, about the epigenome and the systems biology, it simply does not make sense that one single genetic marker could have such a dramatic, determinative effect. A3N: What role has biologization of violence research played in justifying the mass incarceration explosion that began in the 1970s, increasing the prison population from 300,000 to 2.4 million today, giving the US the highest incarceration rate and the largest total prisoner population in the world? AN: To the extent that the longstanding efforts that I have just described have kept in circulation the fallacy that there is a definitive link between human biology and violence, theses ideas have indeed served as a justification for the expansion of the carceral system. And, in turn, the idea that there is a innate predisposition to violence contributes to the decline of support for rehabilitation and reparative justice programs. AN: The revised ten-point platform was prescient in capturing one side of the recent debates about widening health inequality in the U.S. and what to do about it. If I had to venture a guess, I would say that Newton and the Party would have appreciated the historic nature of what President Obama accomplished—a feat that many administrations before his had variously tried to accomplish and failed to do. Perhaps Newton would have even observed that the Affordable Care Act is a very small step in the right direction. --Angola 3 News is an official project of the International Coalition to Free the Angola 3. Our website is www.angola3news.com, where we provide the latest news about the Angola 3. Additionally we are also creating our own media projects, which spotlight the issues central to the story of the Angola 3, like racism, repression, prisons, human rights, solitary confinement as torture, and more. Our articles and videos have been published by Alternet, Truthout, Counterpunch, Monthly Review, Z Magazine, Indymedia, and many others.